As many of you know, today was the first day of the trial in the JKR/WB vs. RDR Books case, in which JKR and WB are attempting to block publication of a print version of of the A-Z listing of the online Harry Potter Lexicon. Update:Reuters video of JKR reading a statement after testifying in court. And many more; please leave them in the comments if you feel we should list them. Leaky was in attendance today, when JK Rowling and Roger Rapoport took the stand; the following can only be guaranteed to about 90 percent accuracy as words were sometimes muffled, writing hands cramped (no recorders allowed) and it was a long eight hours of testimony. No significant words or facts have been changed and whenever in doubt words were put in brackets or estimated. A previous question centered around whether RDR had sold rights to the book in Britain and Australia, as mentioned in the original announcement of the book, at the time of the lawsuit; Roger Rapoport said that only oral agreements had been made at the time but the terms of the contract had not yet been fulfilled. Steve Vander Ark was present at the beginning of the proceedings but was asked to leave a short way into them (and as far as I can tell did not return after JKR‘s testimony, though it’s entirely possible I missed it). She said, “I think that this book [is] wholesale theft of 17 years of my hard work. The Fantastic Beasts and Where to Find Them book and Quidditch Through the Ages were quoted as having sold more than 18 million pounds, or close to or more than $36 million at the current exchange rate. “It’s been my long stated intention” to do so. She has begun work, and is at an early stage, but said she is fleshing out the plan; she once said it was going to take 2-3 years but recently, “four weeks ago, demands of the court case have been such that it has caused me to halt work…It’s really decimated my creative work over the past month. She said the encyclopedia wasn’t the same as writing a novel, that it was not something she’s approach with “the same lightness of heart that you’d approach a novel,” but that the “drudgery” would be worth it because she believes her fans want it and that it would be an opportunity to raise a lot of money for charity. She said she had read “every word” of the Lexicon. “What particularly galls is the lack of quotation marks,” she said, and repeated that most of the book would be put in quotation marks if everything copied was given that treatment. In opening statements, lawyers said that the content of the Lexicon had recently been edited by Steve Vander Ark to reduce the amount of verbatim copying from the two companion books J.K. Rowling has written. “Far from exceptional…simply uses my words. He has taken my creation, because after all, it has no existence outside my words. If we were both describing a giraffe, undoubtedly [they would share words, but] the Chinese Fireball has no existence. “Where to begin?” she said and cited the entry on “Abraxan,” which has “no attempt at etymology.” The lawyers for the defense objected on the grounds that the case was about what was in the book and not what wasn’t in it; the judge said it was noted and allowed the testimony to continue. On cross-examination David Hammer referenced the Death entry and said that the entry wasn’t meant to be about death itself but the character of Death as it appears in the books. JKR said, “Mr. Hammer, with respect, I don’t think you’re showing familiarity with my work,” and pointed out that any entry in a Harry Potter book about death should go into some thematic detail about it. She talked about the Occamy (her lawyer asked if she was pronouncing it correctly and she said, “You can pronounce it any way you like”), listed as a beast in her Fantastic Beasts and Where to Find Them book. She said it was a prime example of one of the “missed opportunities,” and that it should have been a “sitting duck” for Steve Vander Ark because “he claims that one of the books he used…was the dictionary of Phrase and Fable,” and that book contains a reference to the 14th-century logician and Franciscan Friar William of Ockham, most known for “Occam’s Razor” a statement that says, basically, that any explanation should be the simplest one possible. She said it was her little joke that an Occamy has a lot to it which is not necessary (it is a two-legged serpentine-bodied creature with wings). She also mentioned the entry on Remus Lupin: “I would have thought this would be an easy one to add commentary. I would have thought his name would be an easy one – obviously a double allusion to the fact that he is a werewolf…[also] the lycanthropy is an HIV metaphor,” a metaphor for someone infected early, who is prejudiced against and fearful of passing his condition on. It was also an example of “why people might become embittered.” She said none of these things were addressed in the book. She said the Lexicon constituted a “shameless attempt to sell [fans] the same information” they have in their books. Another book mentioned was Fact, Fiction and Folklore by George Beahm, and an entry on Florean Fortescue, which apparently discussed background and roots of the character that JKR wasn’t aware of [but I couldn’t make out what it was, sorry]. Also: from Colbert’s book, she discussed the Fawkes entry, and how, the Lexicon’s entry was a “far from exhaustive list of all the times the pet phoenix appears in the book,” but that Colbert has a three-and-a-half page entry that mentions Egyptian connotations, mythological context and the explanation that Fakes’ name is derived from Guy Fawkes, who tried to blow up parliament. In cross-examination her familiarity with these other books was challenged, and she said that while she knew that there was “massive commentary” in those books she couldn’t say with confidence whether the books were comprehensive. She was asked whether one of them contained a comprehensive list of all her characters, and said she didn’t know because she didn’t comb through them, and asked if the lawyer wanted him to do that now. He said yes, so she paged through one of the books for several minutes to see if all her characters were listed, and said no. She was then instructed to do similar with the Idiot’s Guide to Harry Potter, which David Hammer said was “the one you like so much”; it was no longer with JKR on the witness stand, and she said so, and Mr. Hammer made what he later admitted was a “snide remark” about always carrying it with him (or perhaps that he thought Jo always carried it with her). 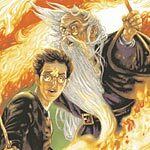 Mr. Hammer tried to make the point that the other books about Harry Potter were shorter, and had longer entries, and it was because the Lexicon was longer that it had shorter entries (and perhaps the book was better because of it): JKR said, “I don’t think that follows at all.” He also brought in two books which he said had been “forced” from the market by J.K. Rowling’s representatives, and JKR classified them as books that she thought were similar to the Lexicon book. There was also discussion over the letter from one of her lawyers to MuggleNet in which the lawyer requested on behalf of JKR that MuggleNet not go through with publishing its encyclopedia (they acquiesced). There was some back and forth about whether her lawyer, Dale Cendali, had the right to say, “Ms. Rowling requests” when they hadn’t had consulted with each other on that specific issue; JKR said her representatives frequently act on her wishes without telling her ahead of time, but that if she had talked to MuggleNet directly she would have said, “You know, I want to do my encyclopedia. Please don’t do this.” Hammer asked if she gave Ms. Cendali guidelines to follow; she said, “I haven’t given her guidelines, she follows the law; those are her guidelines.” She said the only lawyer with whom she regularly discusses these things is Neil Blair. Hammer gave her a copy of a book by Fiona Boyle, and asked if she had ever seen it; she said no, and Mr. Hammer said he had no further questions about it. This testimony had a lot fewer statements that constituted information not already in public documents, and consisted mostly of reviewing e-mails that indicated that RDR Books acted in bad faith and/or infringed copyright willingly. It went over the events that led to Mr. Rapoport contacting Steve Vander Ark and asking him to consider publishing the Lexicon as a book; the plaintiffs tried to show that as a man familiar with the news, Mr. Rapoport was aware of JKR‘s July NBC quote in which she said she was definitely planning on the encyclopedia. Rapoport maintained that he did not know that she was planning an encyclopedia at the time. Asked whether he expected to compete with the HP books, Rapoport said, “Of course not.” Plaintiffs showed an e-mail from August 29, 2007, in which Rapoport said that bookstores were “telling me it should be a paperback” because all the other Harry Potter books were in paperback and the Lexicon would have a hard time competing that way. Regarding how quickly the book was put together: “We publish our books very quickly and this was not an atypical situation for us.” Rapoport also said repeatedly that he didn’t believe the Lexicon was assembled between the time of the signing of the contract and the contract’s deadline, but over the seven years in which the site had been online. He said his company has put together books, from scratch, in less than two weeks, which he said were reviewed well. “This is a book that had been worked on for seven years. You’re making it sound like there hadn’t been a lot of work done,” said Rapoport. It was revealed that RDR had made a deal (which, because of the lawsuit, was never completed) to get an advance from Methuen; Rapoport said they agreed to 5,000 pounds. One e-mail indicated that he thought that was a low figure compared to what was being offered from other countries in Europe; he said that only one other country had offered a higher figure. Rapoport was asked whether the clause in which he indemnified Steve Vander Ark was standard, and he said that every publishing contract was different and that there was no standard contract; the plaintiffs’ lawyer then showed an e-mail to Steve Vander Ark in which he said, “Anything you say in public can and will be used against you…you were not sued and it is also noteworthy that if you are sued, we have agreed to defend you…in standard publishing contracts, the reverse is true.” Rapoport answered that the indemnification was something he felt comfortable doing. There was also another e-mail to a foreign publisher in which Rapoport said there was only an “unlikely event” the book would be challenged, but the letter was sent after two cease and desist letters had been sent. Later, WB asked, “Did you tell any publishers that [JKR] had raised objections?” and Rapoport said no. The lawyers also focused on RDR‘s unwillingness to send WB a manuscript (they told them to hit “print” on the Lexicon web site instead) when it was sending the book via e-mail to foreign publishers (which Rapoport admitted) at the same time. The WB lawyer asked if the other three authors of the book would be compensated; Rapoport said he did not have a contract with them but that Steve Vander Ark intended to compensate them. WB asked if any of the many people who have contributed to the Lexicon over the years were in line for compensation. After a few back-and-forths without answers, he said, “If the book is successful, there is a lot of possibility,” Rapoport said. He said the book was “a lot like Wikipedia,” in the way in which the fans have contributed over the years. The plaintiffs asked if Rapoport had considered that publicity around the case would increase the likelihood of success of the book if they won, and Rapoport said he had never thought about it. Later he said he hadn’t “really” thought about it. “No, I was thinking about whether Ms. Cendali was going to call me up again and scream at me,” he said. He said he never expected the book to be a bestseller and that the clause in Steve Vander Ark’s contract which says that if it reaches the New York Times bestseller list he gets a bonus is one that he’s had in other contracts but which has never kicked in; he’s never published a NYT bestseller, he said. The most any of his books have sold are 10,000 copies. The intended first print run of the book, Rapoport said, was 10,000. The judge asked if that meant they would print more; “maybe 20,000 if we were lucky,” he said. He also said that Barnes & Noble was considering buying 2-3,000 copies; wholesaler Baker & Taylor was going to buy 500 copies for library distribution, and Borders was considering buying 1500 copies. The lattermost figure, he said, was just a consideration but then Borders got back to him and said that they were buying zero copies; the judge said, “because of the lawsuit.” Rapoport said yes. B&N also pulled out because of the lawsuit. Tomorrow, Steve Vander Ark, and potentially RDR‘s expert witness, are expected to take the stand.